Captain of Nebuchadnezzar's body-guard. Nebuzar-adan entered Jerusalem in 586 B.C., burned the Temple, the king's palace, and the houses of the great, razed the walls of the city, and carried many of its people into captivity. He broke up and carried away the brass pillars of the Temple and all the material of the Temple service that was of sufficient value. 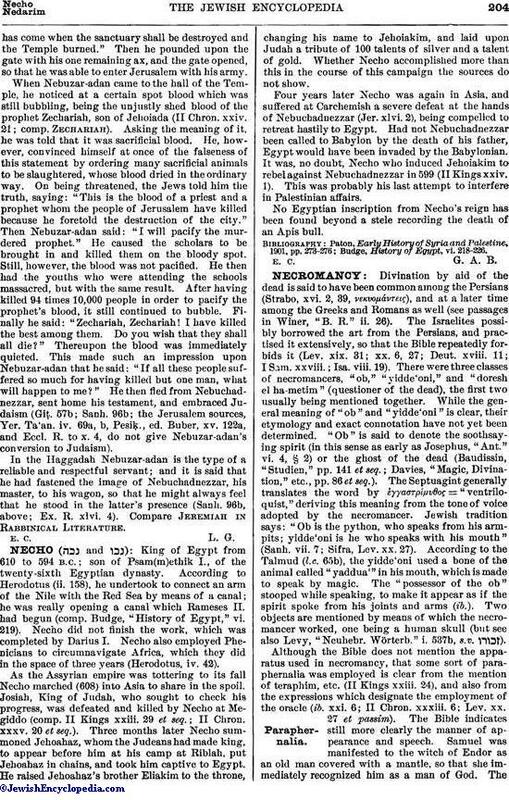 The chief priest Seraiah, the second priest Zephaniah, and the chief men of the city, he took to Riblah, in the land of Hamath, and there put them to death (II Kings xxv. 8-22). Five years later, "in the three and twentieth year of Nebuchadnezzar," Nebuzar-adan came again and carried 745 others into captivity (Jer. lii. 30). Nebuzar-adan, called also Arioch because he fought the Jews like a lion (comp. Arioch in Rabbinical Literature), was sent by Nebuchadnezzar to conquer Jerusalem because the king was afraid to conduct the war himself (comp. 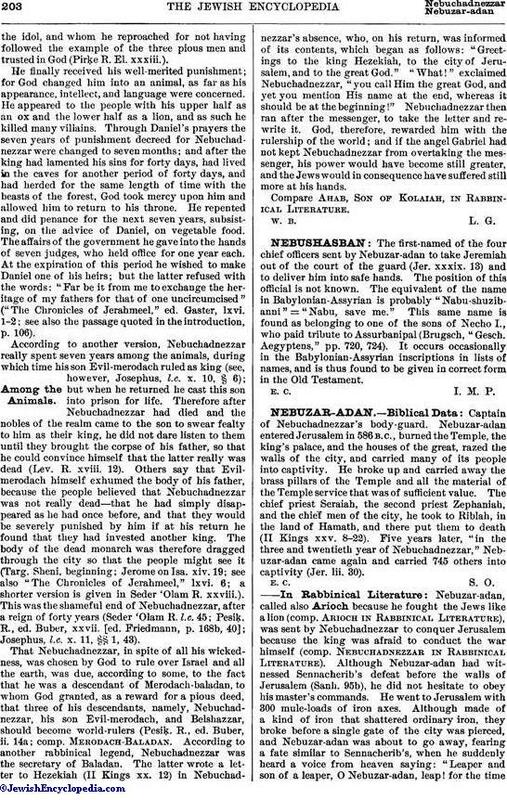 Nebuchadnezzar in Rabbinical Literature). Although Nebuzar-adan had witnessed Sennacherib's defeat before the walls of Jerusalem (Sanh. 95b), he did not hesitate to obey his master's commands. He went to Jerusalem with 300 mule-loads of iron axes. Although made of a kind of iron that shattered ordinary iron, they broke before a single gate of the city was pierced, and Nebuzar-adan was about to go away, fearing a fate similar to Sennacherib's, when he suddenly heard a voice from heaven saying: "Leaper and son of a leaper, O Nebuzar-adan, leap! for the timehas come when the sanctuary shall be destroyed and the Temple burned." Then he pounded upon the gate with his one remaining ax, and the gate opened, so that he was able to enter Jerusalem with his army. When Nebuzar-adan came to the hall of the Temple, he noticed at a certain spot blood which was still bubbling, being the unjustly shed blood of the prophet Zechariah, son of Jehoiada (II Chron. xxiv. 21; comp. Zechariah). Asking the meaning of it, he was told that it was sacrificial blood. He, however, convinced himself at once of the falseness of this statement by ordering many sacrificial animals to be slaughtered, whose blood dried in the ordinary way. On being threatened, the Jews told him the truth, saying: "This is the blood of a priest and a prophet whom the people of Jerusalem have killed because he foretold the destruction of the city." Then Nebuzar-adan said: "I will pacify the murdered prophet." He caused the scholars to be brought in and killed them on the bloody spot. Still, however, the blood was not pacified. He then had the youths who were attending the schools massacred, but with the same result. After having killed 94 times 10,000 people in order to pacify the prophet's blood, it still continued to bubble. Finally he said: "Zechariah, Zechariah! I have killed the best among them. Do you wish that they shall all die?" Thereupon the blood was immediately quieted. This made such an impression upon Nebuzar-adan that he said: "If all these people suffered so much for having killed but one man, what will happen to me?" He then fled from Nebuchadnezzar, sent home his testament, and embraced Judaism (Giṭ. 57b; Sanh. 96b; the Jerusalem sources, Yer. Ta'an. iv. 69a, b, Pesiḳ., ed. Buber, xv. 122a, and Eccl. R. to x. 4, do not give Nebuzar-adan's conversion to Judaism). In the Haggadah Nebuzar-adan is the type of a reliable and respectful servant; and it is said that he had fastened the image of Nebuchadnezzar, his master, to his wagon, so that he might always feel that he stood in the latter's presence (Sanh. 96b, above; Ex. R. xlvi. 4). Compare Jeremiah in Rabbinical Literature.